There is a v-ring seal which provides IP50 ingress protection for speeds up to 3000rpm. This seal can be removed to allow continuous rotation up to 7500rpm. 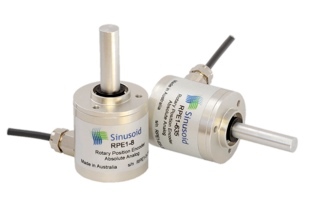 All the RPE rotary encoders from Sinusoid are made in Australia. Two main models are available - RPE1 with absolute analog output, and RPE2 with a combination of incremental quadrature with index and absolute PWM output. The RPE1 has absolute analog output with a 10bit output voltage from 0-VDD, where VDD is the supply voltage - nominally 5V. The output increases linearly for a clockwise rotation. Within these two main models, shafts are available in 6.35mm or 8mm diameter. Mounting is via 3 M3 screws suitable for a flange mount. Termination is a 580mm flying lead with colour coded conductors. Typical applications are robotics, digital potentiometer, angular position indicators, shaft speed measurement, front panel switches, wheel position sensors. All the Sinusoid encoders are RoHS compliant. Sinusoid Pty Ltd is based in Sydney, Australia.